All information added or updated since this page first went up on August 7, 2017 is in GREEN TEXT below. Information still to be determined (if any) is in RED TEXT below. Dates and times that are subject to change at NASA’s discretion are in PURPLE TEXT below. 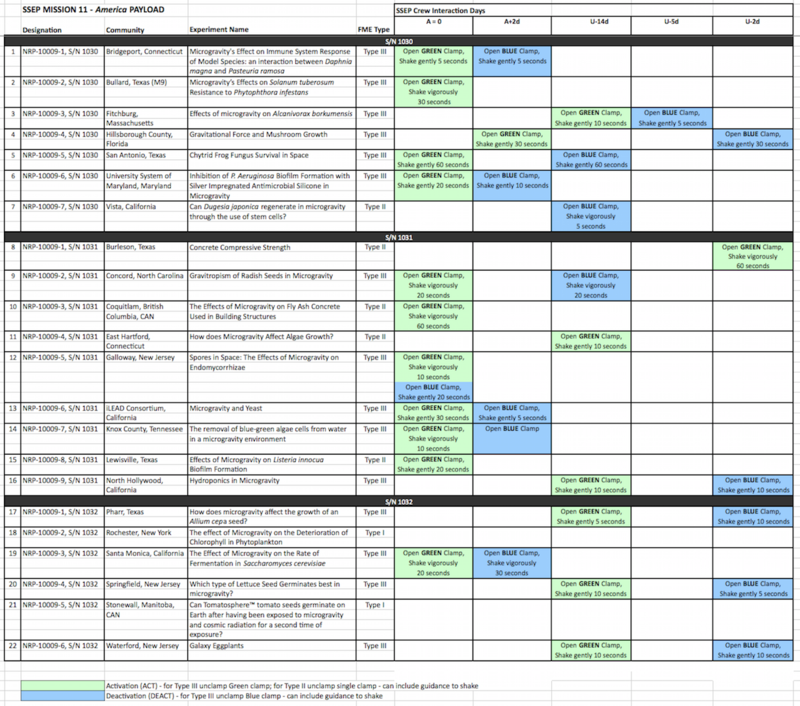 This page provides student flight experiment teams a log of all activities associated with the 22 flight experiments comprising the SSEP Mission 11 America payload (1 Mission 9 experiment is flying with the 21 Mission 11 experiments) from the time the mini-laboratories are received in Houston before the flight of SpaceX CRS-12 to the point when the mini-labs are shipped back to the flight teams after return to Earth. While this page will feature general progress reports on the status of the SSEP M11 America payload, its main purpose is to provide updates to the student flight experiment teams as quickly as possible regarding the handling of their mini-labs on station, so that they can effectively conduct their ground truth experiments. Teams are advised to bookmark this page and check it for updates throughout the mission. Astronauts will work with the SSEP payload at times of the day that fit best in their overall work schedule. Even though crew interactions with the experiments are to take place on pre-specified Crew Interaction Days, the time of interaction can vary from one Crew Interaction day to the next. While the SSEP program team may know the astronauts’ planned work schedule a few days in advance, we’ll not know exactly when the payload is handled until the task is complete. After the astronauts have completed handling of the SSEP payload, NanoRacks will forward a report on the activity to the SSEP program team at NCESSE, and we will then post the details – including the time at which the payload was handled – on this page to make the information available to all student teams as quickly as possible. The report will be posted as soon as it is received, but it may take up to 24 hours for the information from the International Space Station to make its way to the Log. That means, for example, that the details of an activity conducted by the astronauts on the afternoon of a specified Crew Interaction Day will be posted on the Experiment Log no later than the afternoon of the following day (and likely far sooner than that). Ground truth experiments – the control versions of the experiment conducted on Earth while the microgravity experiment is being conducted in orbit – are an essential part of analyzing the results of the flight experiment. Once the flight experiment returns to Earth, simultaneous harvesting and analysis of both the flight experiment and the ground truth experiments allows the research team to assess the role of gravity in the physical, chemical, or biological system under study. It is hard to imagine how the role of gravity can be determined without ground truth experiments conducted at the same time as the flight experiment. However, given that it may take up to a day to receive a report on exactly what time of day a specific activity was conducted with an experiment aboard the ISS, student teams are encouraged to shift activities with their ground truth experiments by 1 day (24 hours). That will allow teams to ensure that the timing of activities they carry out on their ground truth experiments accurately reflects the timing of activities with their experiment aboard the station. This is especially important for experiments that are sensitive to exact timing. For example, if a microbiological experiment is likely to produce different results depending on whether it is active for 40 or 50 hours, the teams will want to match the exact timing of the experiment aboard the station with their ground truth experiment. Nomenclature: The purpose of this log is to provide the student flight experiment teams information on the handling of their experiment, as well as providing updates on the progress of the Mission. For this log, the individual experiments are assigned a flight Designation such as “NRP-10009-4, S/N 1030” together with the Community and Experiment names (see Section 4 below). August 14, 2017, 12:31 pm ET: SpaceX CRS-12 launched from Space Launch Complex 39 at Cape Canaveral Air Force Station, Florida. Following launch, the first stage Falcon returned to Earth and landed successfully. All launch stages were nominal and Dragon continues on it’s way to the International Space Station for an anticipated rendezvous on Wednesday, August 16th. August 16, 2017, 9:07 am ET: With the fastening of 16 bolts, the Dragon spacecraft is now a part of the International Space Station. August 16, 2017, 6:54 am ET: Capture confirmed! Astronauts Jack Fischer and Paolo Nespoli controlled Canadarm2 grappling Dragon at 6:52 am. NRP-10009-7, S/N 1030: Vista, California, Can Dugesia japonica Regenerate in Microgravity through the use of stem cells? NRP-10009-4, S/N 1031: East Hartford, Connecticut, How does Microgravity Affect Algae Growth? NRP-10009-1, S/N 1032: Pharr, Texas, How does microgravity effect the growth of an Allium cepa seed? NRP-10009-5, S/N 1032: Stonewall, Manitoba, Canada, Can Tomatosphere™ tomato seeds germinate on Earth after having been exposed to microgravity and cosmic radiation for a second time of exposure? September 17, 2017, 10:15 am ET: After more than a month in orbit, Dragon parachuted into the Pacific on Sunday around 10:15 am EDT. September 17, 2017, 4:40 am ET: The capsule was released from the Canada Arm of the ISS at 4:40 am EDT Sunday by astronaut Paolo Nespoli. September 21, 2017: NanoRacks confirms, all flight mini-labs have been return shipped to communities. September 20, 2017: NanoRacks confirms, first of flight mini-labs have been return shipped to communities. The Student Spaceflight Experiments Program (SSEP) is a program of the National Center for Earth and Space Science Education (NCESSE) in the U.S., and the Arthur C. Clarke Institute for Space Education internationally. 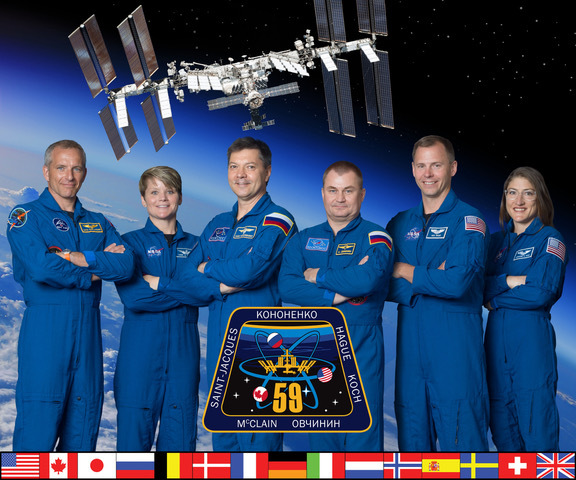 It is enabled through a strategic partnership with NanoRacks LLC, working with NASA under a Space Act Agreement as part of the utilization of the International Space Station as a National Laboratory. SSEP is the first pre-college STEM education program that is both a U.S. national initiative and implemented as an on-orbit commercial space venture. The Smithsonian National Air and Space Museum, Center for the Advancement of Science in Space (CASIS), and Subaru of America, Inc., are National Partners on the Student Spaceflight Experiments Program.